The last two days I finally decided to start exploring and really take in the city. I had an “oh sh-t” moment and realized that I was not on track to see everything on my list. I decided to make the most of what I could. Due to the Protests, the Catacombs were closed. The Louvre does not open every section on certain days of the week. I wanted to try the Jay-Z & Beyonce self-guided tour, but unfortunately, the Red Room was closed on Friday. On the plus side, I saw most, if not all, of the Denon wing between my two visits. My friends and I visited the Eiffel Tower … again. The first time we went to the Eiffel Tower, it was closed. Although I was able to capture really great photos the first time around, my mission was not accomplished. The second time, we were able to go all the way to the top of the Eiffel Tower. The elevation and city views are very similar to that of being on top of a mountain. The wind, however, was very similar to being stuck in a monsoon (minus the rain and dust. 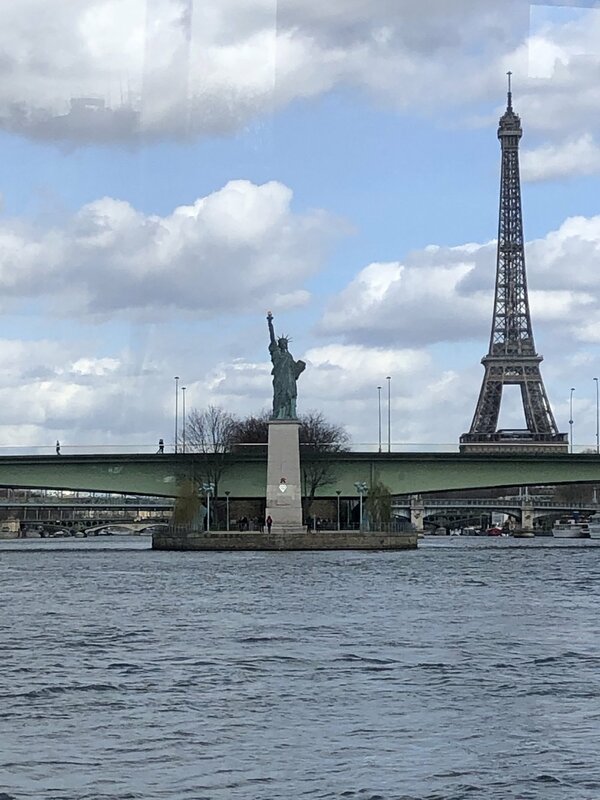 As part of the larger group, we took a scenic cruise on the Seine River. Paris was an eye-opening experience. Although I would love to start with French being something I learned in France, that would be a lie. I did not know that Paris was a walking city (and booooooyy do my shoes feel it). I learned to always go to the bathroom before you leave for something. Most toilettes are not free in Paris (& restaurants make you buy something). Diversity in Paris is such an interesting conversation. France doesn’t count “race” so according to our tour guide, racial issues and prejudices are sometimes swept under the rug. Frenchmen also don’t have the equivalent of an “n“ word - in a sense, that is cool because it’s less divisive, but also as an African American, it’s a little difficult to comprehend. Lastly, budget in all currencies you will use for the duration of the trip. Visiting the Palace of Versailles was one of the most enjoyable activities. It was beautiful. Funny story: My friend & I were using Apple Maps to guide us to the palace. If you know anything about Apple Maps, there is room for improvement to say the least. We were looking around thinking we were heading in the wrong direction. We looked up & saw a building covered in gold. It’s both crazy and amazing that I stood in such an influential place. The palace was so overwhelming. We went towards closing so time was limited. The tour has an audioguide which explains all the rooms & their purposes. If I could go back, I’d probably try to touch King Louis’ bed. The money I spent shopping - Paris has the really great designer shopping. The art - there are so many museums and they are all relatively close to each other.